3-section melamine plate approximately 9 inches by 8 inches. 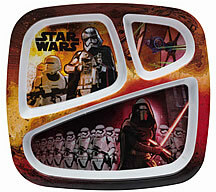 Great for little fans of Star Wars. Also great for keeping the food on the plate.